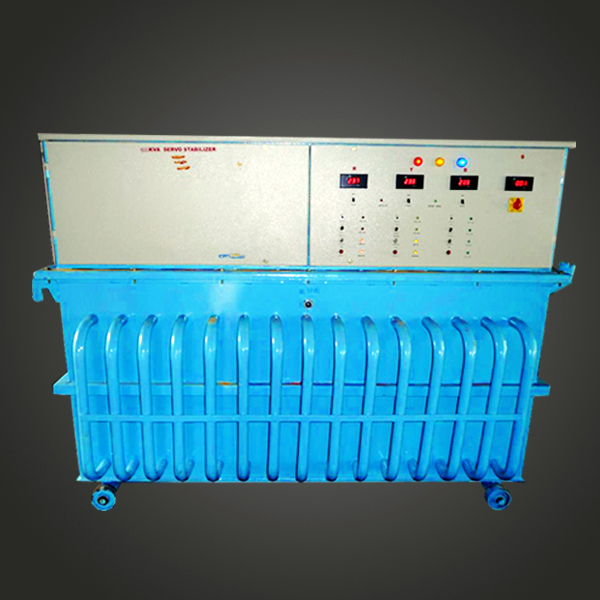 Backed by our dexterous professionals, we have emerged as a reliable Manufacturer and Supplier of Three Phase Oil Cooled Servo Controlled Voltage Stabilizer in Hyderabad. The Three Phase Oil Cooled Servo Controlled Voltage Stabilizer we make available are manufactured in conformity with international quality standards and norms. To cater bulk and urgent requirements of buyers, we maintain a large stock of Three Phase Oil Cooled Servo Controlled Voltage Stabilizer at our state-of-the art warehouses. Buyers can obtain the Voltage Stabilizer at market-leading rates. Speed of Correction	 30 V per sec. Controls on each Phase Auto/Manual Selector Switch,Increase/Decrease Selector Switch,Volts adj. Potentiometer. Metering Voltmeter to read Input and Output Voltages with selector switch, Ammeter to read the Output current. Other Indications & Controls	 Input R, Y, B Indications in each ph 3phOutput on Indication,Reset Auto/Manual selector switch Output On Switch Output off Switch. Protection Low Voltage Protection,High Voltage Protection,Over load Protection,Short Circuit Protection, Single Phase Preventer.